Sky, however, are one rider down after Italian Gianni Moscon was kicked out of the race on Sunday for hitting a French rider, which will do little for the team's popularity in France. Sir Brad, Molly Weaver and Adam Green discuss Geraint Thomas versus Chris Froome and the dynamics within Team Sky. Brailsford, who has been questioned by a British parliamentary inquiry following allegations Sky had breached ethical guidelines by abusing the legal use of Therapeutic Use Exemptions (TUE's) for their riders, said he did not expect the abuse to stop. The Tour de France is promoted as the world's greatest annual sporting event and, if you want the best global riders to come to your country, maybe treat them with a little more respect. This late in the Tour, that might not be such an issue but with three Pyrenean stages to come, the workload for those five will increase, as - if there is an internal battle within Team Sky and further baiting from outraged fans - will their stress. "That's the way I see it really". "We accept it and we have to make a decision about how to behave - we're trying to remain dignified, we're trying not to react and we're trying not to get distracted by it", he said. "Winning the Tour would be insane too, which is why I'm not thinking about it". Moscon's exit leaves Sky with seven riders, though they had been along among the teams targeting general classification in not losing a rider already. 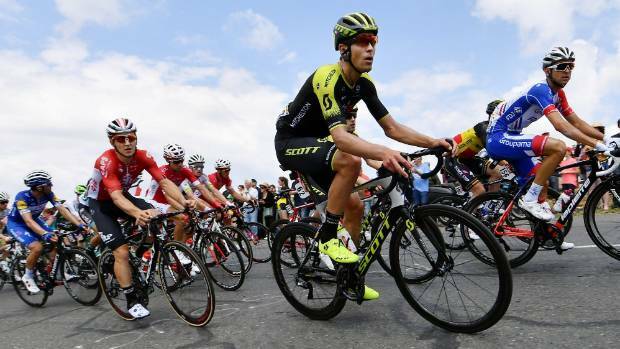 Team Sky's Tour de France bid plunged into turmoil after one of its riders was disqualified for punching an opponent. The Kenyan-born Briton had double the permitted amount of the drug in his sample when he won the race in 2017. Cycling - Tour de France - Rest day - Carcassonne, France, July 23, 2018. "The Spanish, fantastic. It just seems to be a French thing". Like a French cultural thing. "I'm sure there would have been a word or two about that". But it's okay to spit at us and our staff? It's very, very intimidating. "It's a shame, but we're not going to let it distract us". While incidents of actual violence - such as the fan that slapped Froome on Alpe d'Huez - are of concern, Brailsford said Sky had learned to tune out the boos.